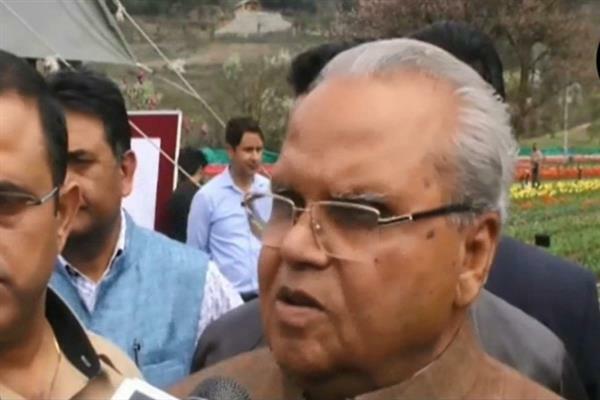 Srinagar: Jammu and Kashmir Governor Satya Pal Malik today asked the mainstream leaders to behave like leaders and not erase the line that makes you different from separatists. Addressing reporters here at Tulip Gardern Srinagar Governor said the mainstream leadership is very important to them and nothing will work in Kashmir without them. “But they should not talk like separatists,” he said. About the highway ban Governor said they will reconsider the decision and no such step will be taken that will create hardships for the people of Kashmir. He said that the elections will be conducted in a much better way and all the parties who need security for their candidates should reach to the Governor’s office. “I have spoken to both the leaders and have asked them to send the list of their candidates who need security,” he said. Governor appealed tourists to visit Kashmir, saying that Kashmir is very safe to visit and is the world’s most beautiful place. “Kashmir is, was and will always remain a safe place for tourists. There can be danger for people like us, but the place has always been safe for tourists,” Governor added.